Let there be no cap or CBA (CDA?) on your dreams. The deadest part of the off-season is here, but soon there will be #MuscleWatch, training camp hype, hopefully the disappearance of rankings, and eventually buzz around pre-season performances. We’re almost to the 2014-15 season, and good lord it can’t come fast enough. But yes, there are not one but two posts for this team. Part 1 covers the starters, part 2 the reserves. The guidelines for selecting this team are fairly simple. Make a 12-man squad without exceeding the 2014-15 salary cap of $63.065 million. Rookie deals are off-limits, but I don’t feel the same about minimum deals or exceptions since I can’t go over the cap in any way. I don’t think this is the best roster I could put together, mostly because of my math skills and overall intelligence of the players in my made-up, cap-friendly player pool. I give the team a B+. Only one of LeBron James and Kevin Durant made the team. I WILL TRY TO EXPLAIN THIS. Cap hits were via Spotrac.com. Many of their contracts match Basketball-Reference’s, though they are up to date with recent signings across the league. Don’t worry, B/Ref. I still love you. I’ve never went back and forth with so many players. A few slots were chosen at the last second. 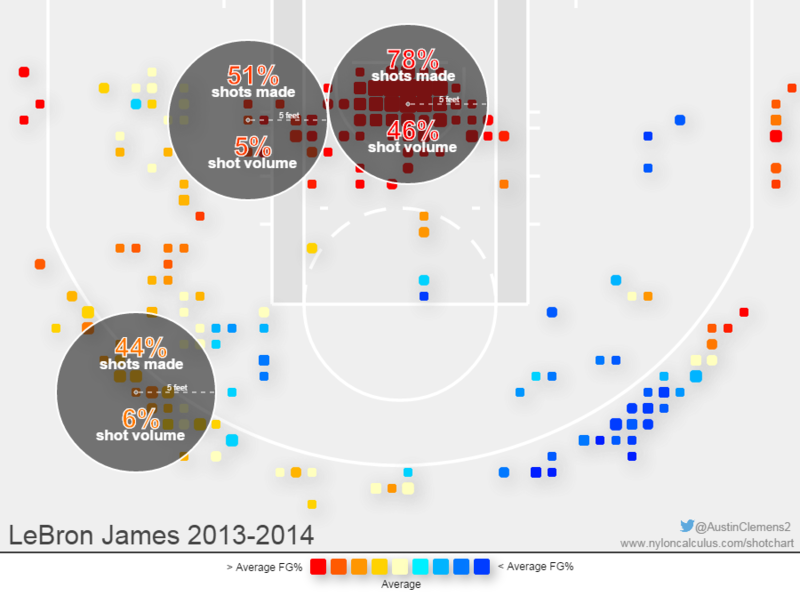 On to naming the starters, each with a Nylon Calculus shot chart. Austin Clemens for off-season MVP! Timofey Mozgov was the center for the longest time, even in some projected lineup stats until I caved with Robin Lopez. Mozgov was $1.5 million cheaper, cracked the top 35 in Seth Partnow’s rim protection stats, and held up in a few all-in-one metrics. He was also productive as last season came to a close, averaging 14 points and nine rebounds in 27 minutes over the final 16 games. There were also flashes of becoming a stretch 5. Well, sort of. Regardless, Mozgov should be the Nuggets’ starting center rather than JaVale McGee or the out-of-position J.J. Hickson. He doesn’t have the silky smooth 3-pointer Mozgov possesses, but he’s one of the very best rim protectors and holds up better in the same all-in-one metrics. He also used only 14% of possessions last season while on the floor, often with one of the most potent starting lineups in the league. Sure, Lopez will make an awkward hook shot, maybe swish a mid-range jumper or make teams pay for fouling him with a free throw percentage surpassing 80, but for the most part he’ll bang with opponents, protect the rim, and get boards. He actually led the league in contested rebound% and would be a terror on the offensive glass if his defender sags off him and helps against any of the high-usage players I chose. Lopez can also log more playing time than Mozgov, finishing last season just over 30 minutes per, and he’s durable, missing only two games the last three years. Mozgov has yet play the same major minutes over a full season, but 2014-15 could be a year when he clears those benchmarks. 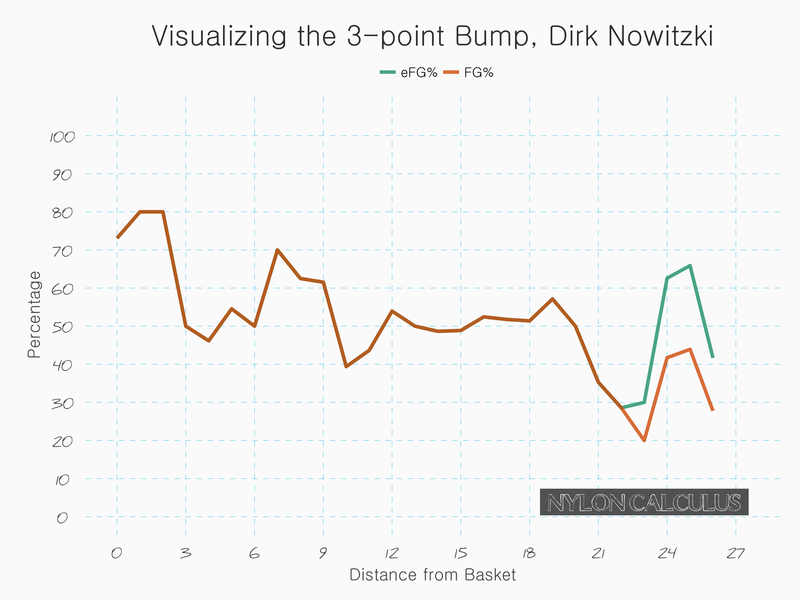 In 2014, Nowitzki recorded a career-high in eFG% and a 3-point rate not seen since teaming with Steve Nash. With a pay cut that will last through possibly 2017, he might be in this series for a while. Maybe Nowitzki would be like 2011-14 Chris Bosh, but the holes he can drill in a defense just off the ball would open a ton of room for younger, springier players I selected. Defensively, it’s possible Nowitzki could be hidden thanks to another forward I chose, one with height and strength to play the ‘4’ in doses, but this squad was made to outscore than lock down. 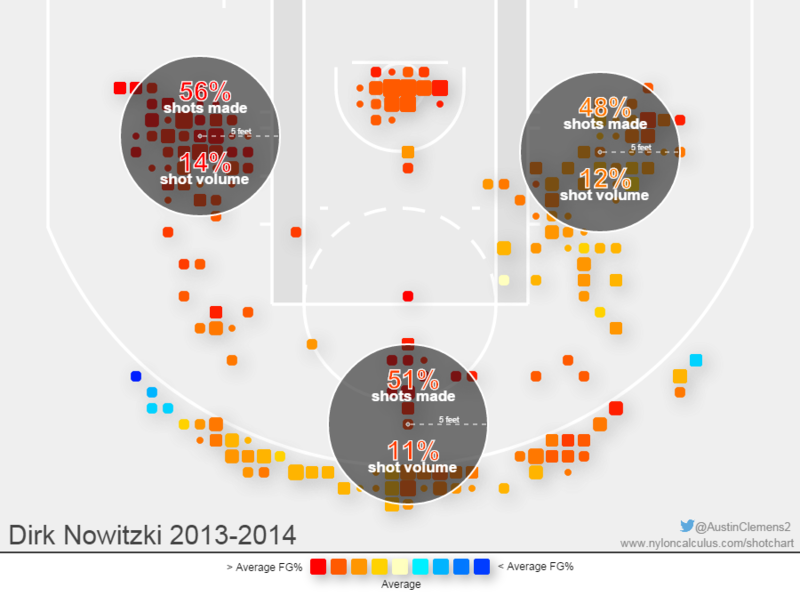 It looks like both Lopez and Nowitzki would hang back in pick and roll coverage. I still can’t believe I can type LeBron James, Cleveland Cavaliers. If I had to, I’d fit both James and Durant on this team, but together they take up $40/63 million in available cap space and, while it’s tempting to go top-heavy with this roster, a LeBron-Durant-Nowitzki/Curry trio with nine minimum contracts isn’t as fun a roster to write about as one with depth. We don’t yet know who the injury bug will bite anyway. In the all star break-related post, I might go with a huge 3, but this off-season brought nice, still-healthy bargains. This wasn’t an easy choice. Durant was about $1.5 million cheaper, and that million or two saved for each slot adds up. He has more range, should be a better defender next season, and can carry a higher scoring load with less long-term effects. He might also improve on his assist rate, and, who knows, he may play more power forward and add a clever post move. Durant may very well repeat as MVP. I wondered if he was the best fit with all the other shooting I plucked. To get the juiciest looks at the basket, somebody needs to consistently bend the defense and LeBron can do just that, able to get to any spot. Durant isn’t at that level partly thanks to a slimmer build. Pesky defenders take advantage of that. It looks like LeBron will be bit slimmer this season, though, so we’ll see how that impacts him. LeBron is as positionless as it gets, and if not for the slip in defense is as perfect a player as could be, but his defense has slipped. We’re probably at the slight downturn of his career, and if this team was made for five years versus one, I’d flip-flop my choice for small forward. Regardless, this is LeBron’s third straight appearance here, and if it’s in his diet he should celebrate with a ham sandwich. 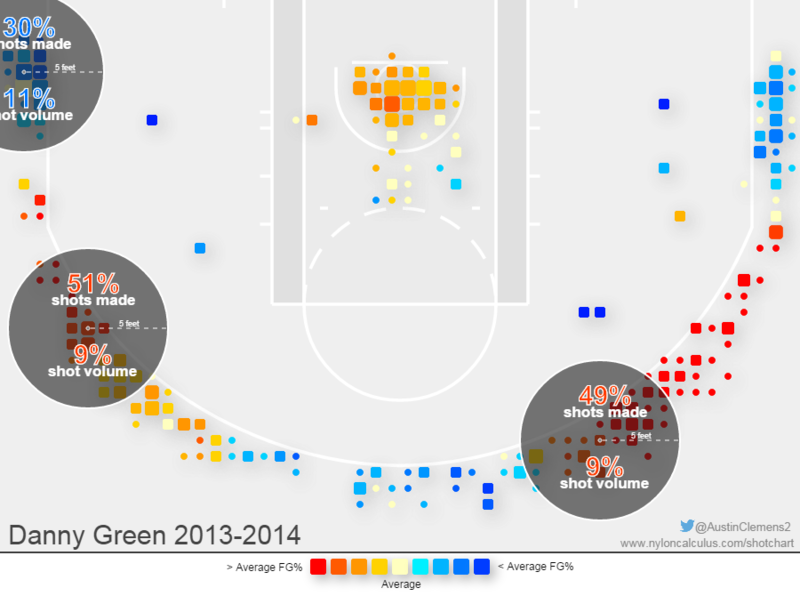 Green is third to repeat here, on the first team before replaced by the ~$900K salary of P.J. Tucker. 3-and-D players are an essential piece to any winning team, but especially one with three high-usage players who aren’t elite defenders for long periods of time. Green would take on the toughest defensive assignments, though it wouldn’t exactly be ideal to have him chasing point guards. Some on/off fast break stats for Green are pretty interesting. Opponents scored 1.1 less points per 100 possessions when he was on the floor and two less points after all turnovers, per NBA.com. The difference in the former stat would’ve bumped the Spurs from 11th in the league to the top five while the latter would take them from eighth to behind only the Hornets who were in a league of their own. It’s also worth noting Green has never fouled out in his short career, and the five-foulers are nearly as rare. Some of this is helped by minute totals, but the Spurs organization should also get credit. Now to Green’s offense. According to Basketball-Reference, 75% of his shots came within three feet or beyond the arc where he shot 69.8% and 41.5%, respectively. He’s a limited scorer, though, an adventure when dribbling despite a solid pull-up shooter, and only shot 35.8% from the corners. That corner 3P% might be an outlier when the past two seasons were 45.1% and 43.3%, respectively, and ~36% is fine anyway. Sometimes that and ~55% around the rim is criticized too harshly. Despite Green’s limits offensively, he has a history of explosive performances in high-pressure games. Hopefully someday my point guard gets a really deep postseason run so we can say the same for him. Many of the best shooters need a teammate to bend the defense before being fed an attempt, and what better teammate to do that for Curry than LeBron? But Curry can do it by himself, something similar to what Ian Levy wrote about recently. 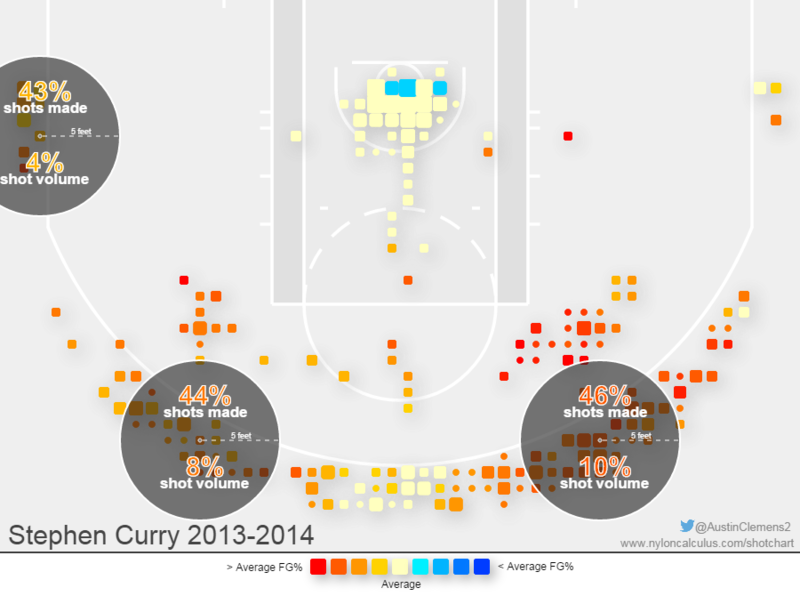 Curry not only demands attention off the ball, but defenses shift to his movements on the dribble as well. He can get shots off anywhere with the smallest of spaces to work with, either with some crazy dribble combinations or off the catch. 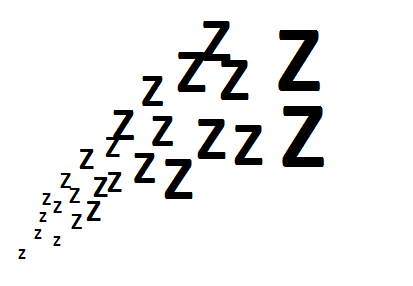 Curry’s flamethrowing makes him a one-man offense for stretches, his heat waves sometimes more like…tsunamis? He’s somehow taken over 1,200 threes the last two seasons and made 44%. For this team, he could carry bench units, playing off the ball when alongside LeBron, but it would be something of a waste to not unlock his on-ball shooting in stretchy, starter-heavy lineups. How good could Curry be alongside, say, Nowitzki? We could look at his shooting alongside a stretchy forward like Draymond Green instead of David Lee. With Green on the floor, Curry shot 50% from three compared to 38.6% with Lee, according to nbawowy.com, and hoisted 11.9 threes per 100 possessions with Green compared to 9.5 with Lee. Overall, his usage increased from 26.2 to 31.4. This isn’t meant to blame Lee’s limitations for Curry’s drop in those stats, but stretch and space matters for all positions. With all the scoring in this lineup, Curry would still take a backseat some of the time. Not the worst thing in the world since he, like Durant, is on the slimmer side with some of the same problems with pesky defenders, and he can be turnover prone. In particular, he sticks out quite badly in this passing chart I made a while back. Regardless, he’s only 26, and it’s not at all bold to claim he’s the best shooter alive. Soon he might also be the best point guard in the league. 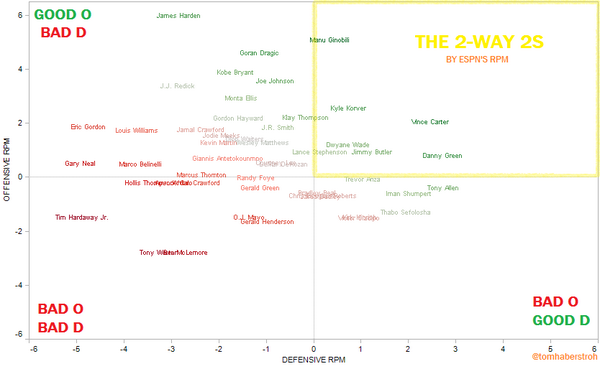 Every player played for very successful offenses last season, minus Curry. There’s a mix in usage, some are slashers and others high in assisted shot %, and most hold up well in all-in-one metrics. It also looks like my starters will never commit a foul. Obviously most stats would change, for better or for worse, if these players were together. Most obvious might be Basketball-Reference’s usage rates since, together, this unit would have to top out at 100%. That would actually help the projected offensive efficiency. Right now, without tinkering with the usage, the points per 100 possessions balance out to a whopping 118.6, 6.5 more than the 1st-place Clippers last season. That number would only improve as the lineup is forced to use less possessions, according to a couple notable people. 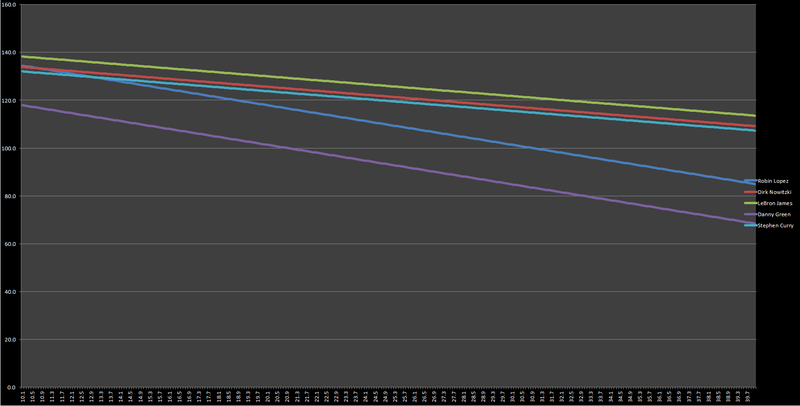 Some time ago, Eli Witus found the following related to lineups and usage, among other super interesting things in his study: “In general, for every 1% that a lineup has to increase its usage, it’s efficiency decreases by 0.25 points per 100 possessions, and vice versa.” It’s a bit harder and probably pointless to project a lineup of five guys who weren’t teammates last year, but under Witus’ study this lineup go from scoring 118.6 points/100 possessions to 122.9. We can tack on an extra point or two with amount of three-point shooting provided from four of the five players. With the low-usage, Lopez and Green dive harder than the big 3, but Lopez’ offensive rating gives him a head start. Nowitzki and Curry are neck and neck while James, as expected, is in good shape. Not bad, and somewhat close to the previous projection of 122.9, but keep in mind the usage rates of Lopez and Green. What if each player was at 20%? That comes pretty close to what Witus’ study would suggest this lineup would score, but I can’t see those usage rates actually happening for a bunch of reasons. It would involve Green passing up what’s probably a few juicy looks from the arc, specifically from the corners since he’s the least versatile shooter, and those shots need to be taken. Who knows, though. Maybe he just never commits a turnover. As for the other players, it’s probably not ideal for LeBron to use over 27% of possessions and Dirk about 25% for an entire season. So those projections might’ve been iffy, but the starters are a decent blend of players. Lopez and Green are already two of the best low-usage complimentary players out there, both providing some nice defense in the process. As for the trio, Curry and Nowitzki’s skill sets allow for a seamless transition into second and third options while LeBron, despite in his 12th season already, should be just fine. The rest of the roster will be explained in part 2. Centers: Timofey Mozgov, Channing Frye, Omer Asik, Serge Ibaka, Al Horford, Tim Duncan, not Andrea Bargnani, Pau Gasol, and Boris Diaw. Power Forwards: Kevin Love, LaMarcus Aldridge, Blake Griffin, not Amar’e Stoudemire, Greg Monroe, Kevin Garnett, Amir Johnson, Ryan Anderson, Paul Millsap, and Boris Diaw. Small Forwards: Kevin Durant, not Gerald Wallace, Paul Pierce, Kyle Korver, and Boris Diaw. Shooting Guards: Wesley Matthews, not Kobe Bryant, Vince Carter, Arron Afflalo, and Boris Diaw. Point Guards: Goran Dragic, not Deron Williams, Mike Conley, the unsigned Eric Bledsoe, and Boris Diaw. And all other players that are cap-friendly (or not) who flew over my head.